We must always clean first and then disinfect, two steps we need to know. And there is a difference between cleaning and disinfecting, something else we need to know. But it appears that some in the facility maintenance and professional cleaning industries may be missing a few steps—and doing so can potentially cause serious harm to human health. This is because proper cleaning and disinfecting kills germs. We are also seeing some cleaning solutions manufactured for the professional cleaning industry that carry a label that these products “clean and disinfect” surfaces. While cleaning and disinfecting a surface does help stop the spread of disease, what these product labels seem to suggest—or at least the message some building managers and cleaning professionals are receiving—is that cleaning and disinfecting a surface can be done in a one-step process. For building managers, cleaning professionals, as well as cleaning contractors, this would appear to be very good news. Any cleaning solution that can clean and disinfect all in one step can save a considerable amount of time in the professional cleaning industry, and time is money. 1. First, use a cleaning solution to remove visible soil from surfaces. 2. Rinse the surfaces with fresh clean water (this helps remove chemical residue, which can attract more soils). 4. Rinse the surfaces again with fresh clean water. This is starting to sound pretty confusing. To help clear things up, let’s use a discussion of handwashing and germ killing as an example of how this works. When it comes to our hands (and this applies to surfaces as well), not all bacteria, germs, and pathogens are the same size. The smaller the pathogen, the easier it is for it to become wedged within the cracks and creases of the skin on a human hand. In many cases, a hand sanitizer can kill or minimize the number of surface-level pathogens on the hands but not necessarily those imbedded in the cracks and creases of the hands. What does remove these imbedded pathogens is proper handwashing. The agitation created in the handwashing process dislodges these pathogens from the cracks and creases and surfaces of hands, enabling them to be removed when the hands are rinsed. Once these pathogens have been removed, a hand sanitizer can kill any germs and bacteria that may remain on the hands. It’s the same when cleaning surfaces. Many countertops, for instance, in commercial restrooms are made of tile and grout. These are very porous materials. So while using a one-step cleaning and disinfecting process may remove some soils and kill some surface-level pathogens, its effectiveness at removing all soils, especially those lodged in the pores of the tile and grout, may be minimal at best. We should also make mention of how a disinfectant actually works. Once applied to a clean surface, the disinfectant dissolves cell walls, essentially eliminating germs and bacteria which are then wiped away. In some cases, just using a more effective cleaning process and practices will do the same without the use of disinfectants. • As mentioned earlier, it reduces cleaning times and related costs. 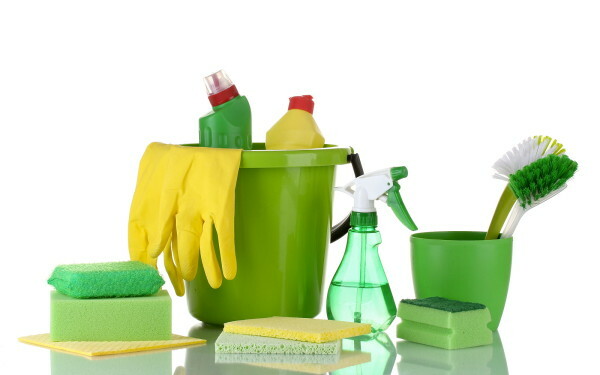 • Cleaning pros, like other workers, have a tendency to not read product labels; some cleaning solutions, even those marketed as a cleaner and disinfectant, will note, if reading their labels closely, that heavily soiled surfaces should be cleaned first. • Reducing the use of disinfectants is better for the environment. • The one-step process helps reduce the number of cleaning solutions needed to clean surfaces, another cost savings. • Education: First, cleaning pros must be educated on the importance of cleaning surfaces first and then disinfecting. This is a must-do process. • Alternative cleaning systems: Look into cleaning systems that can address some of the barriers to using a multistep process to clean and disinfect surfaces and still be fast. For instance, while wiping surfaces with cleaning cloths can be slow, aqueous ozone cleaning system are faster and can eliminate the need for powerful cleaning solutions. • Reading labels: Cleaning workers must read and understand product labels. Professional cleaning can be a hazardous profession; reading product labels can make it safer. As we know, the goal of the professional cleaning industry is to protect health. Sometimes we may think we are accomplishing this but upon great inspection, we are not. Making sure cleaning solutions are used properly. Investigate alternative cleaning process that have been proven to be effective and help ensure we our meeting our industry’s goal. And always remember clean first and then disinfect are steps you need to know..